In the neighborhood where we live – as soon as warmer weather makes an appearance – everyone is outside! After a long winter, it has been so nice to visit again with neighbors and get together with friends for impromptu cookouts and barbecues! With that spontaneous entertaining in mind, my husband Jack and I usually keep some foods on hand that can be used to pull together a delicious dish to serve to our guests, or to bring along to a neighbor’s house as our contribution to the festivities! This Onion Jam Crostini with Herbed Goat Cheese is a perfect example of a super delicious and impressive appetizer you can quickly pull together when you need it! 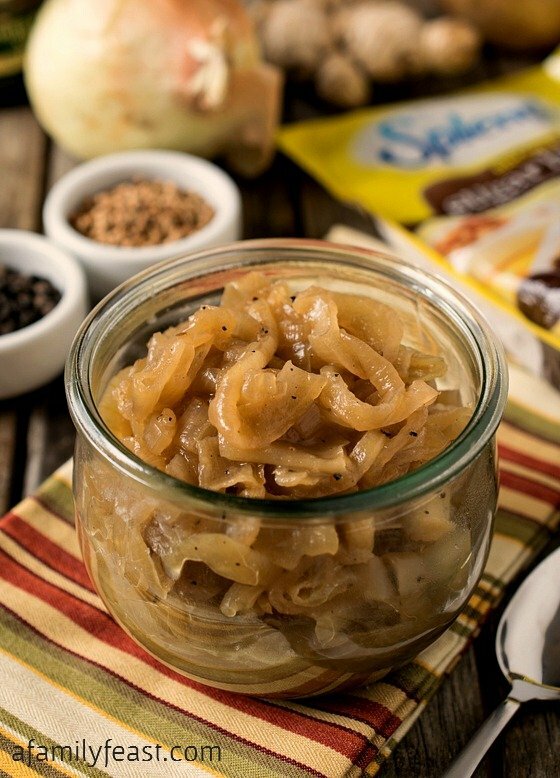 It all starts with our easy and delicious onion jam – a sweet and zesty mixture made from Vidalia onions. We cook the onions with some butter and SPLENDA® Brown Sugar Blend over low heat until they are reduced and caramelized, and the jam also has a zesty kick from the addition of white balsamic vinegar, freshly grated ginger, plus other seasonings! We cook up a batch of this fantastic jam – then store it in the refrigerator. It’s great used to make these Onion Jam Crostini with Herbed Goat Cheese, as a topping on burgers, or even as a simple side served with grilled meats! Swapping in SPLENDA® Brown Sugar Blend like we did in this recipe is a great option when you’re looking for ways to add sweetness but want less added sugar. It offers the same sweetness as regular brown sugar, but without all the calories! All SPLENDA® Sweeteners are versatile, and they can be used in baking, cooking, and beverage mixing. Now, getting back to this fantastic Onion Jam Crostini with Herbed Goat Cheese…just slice up a baguette, add some goat cheese that has been blended with some fresh herbs, and top with our delicious onion jam, sun dried tomatoes and arugula. Your friends will be very impressed with this Onion Jam Crostini with Herbed Goat Cheese – and it’s the perfect light and delicious appetizer for any gathering! Visit the Sweet Swaps program here for hundreds of ways to save calories by swapping full sugar for SPLENDA® Sweeteners. For more information visit SPLENDA® on their website, Facebook, Twitter, Pinterest or Instagram. In a large pot with a tight fitting lid, place onions, SPLENDA® Brown Sugar Blend, balsamic vinegar, butter, ginger, salt, coriander and pepper. Cover and bring to hot, then reduce heat to low. Cook covered over low heat for one hour. Remove lid and cook over low for two more hours or until onions are tender and liquid has evaporated. If onions cook before liquid evaporates, drain and discard liquid. Cool onions to room temperature. While onions are cooking, place olive oil, shallots, thyme and parsley in a small sauté pan and cook over medium low for about five minutes or until shallots are soft. Remove to a small bowl and add goat cheese and stir to combine. Set aside. Heat a ribbed grill pan, brush the bread slices with oil and grill just to reveal nice grill marks. Spread the cheese evenly between the slices. Then spread the onions mixture over the cheese, dividing evenly. Finally top with sun dried tomato slices and garnish with the arugula before serving. This looks absolutely fantastic! I know that you mentioned this is a sponsored post for splenda, but if we wanted to make it with regular brown sugar, what would the measurement be? Does it remain 1/2 cup? Hi Ruba – Thank you! The amount of Splenda brown sugar is 1/2 the amount of regular brown sugar – so double what is called for in the recipe. Enjoy! This onion jam sounds like my kind of jam! YUM! I really have to make this! Mmmm I wish I lived in your neighborhood so I could taste some of your yummy snacks!! Onion jam with goat cheese sounds like a crazy good combination! I will have to try this for sure! I could eat onion jam straight with a spoon and then you add goat cheese? Can’t get any better! I love everything about these! YUM! Such powerful flavor packed into a little package! These sound absolutley delicious. Wow! That onion jam sounds amazing. I would smear that on lots of things! Love crostini. We are the sa,e as you – outside as much as we can be!~ Its all about BBQ’s hangouts, corn hole games and tournaments, biking and outdoor restaurants! Everything about this crostini is for me!